Martina Bellini, keyboardist and programmer from Italian Progressive Metal band SCHYSMA has signed the endorsement deal on May 3rd, and is now sponsored by CME pro, like as Henrik Klingenberg (Sonata Arctica), Andrea de Paoli (Labyrinth), Alessio Lucatti (Vision Divine, Labyrinth). 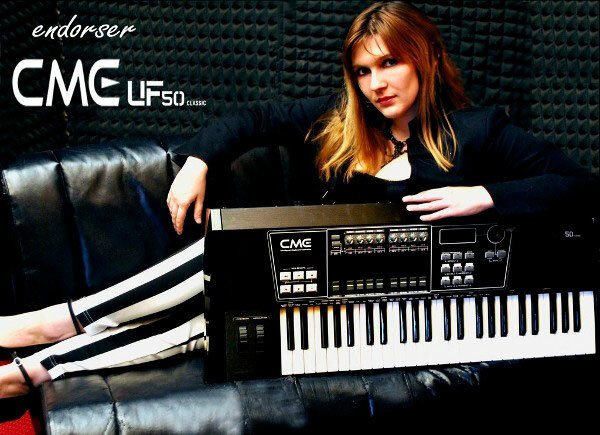 Martina said, "I’ve chosen the new UF50 classic master keyboards model for its excellent reliability while playing live, its user friendliness and its wide choice of controls. I’m sure that I will obtain great results thanks to this controller. I would like to thank Duilio Salvucci for making this collaboration possible."